“I want to help.” Jaden hoped his voice didn’t betray how nervous he was. 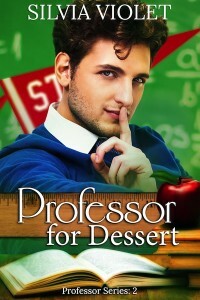 As he collected parfait glasses, he thought again about how good the cake would taste as he licked it off his professor. “Really. It’s not necessary.” Dr. Perkins’s words were rushed, tumbling over one another. He’d lost his usual cool. Jaden hoped he was reading things right and the professor was as interested as he was. Jaden reached for another glass, deliberately letting his arm brush against Dr. Perkins. The professor tensed. The heat of his body made Jaden crave more contact, but he fought the urge to rush things. He needed Dr. Perkins to be comfortable when they were alone. Maybe he could get the professor to offer him an after-dinner drink. They could talk, maybe get a little drunk, see where things went. Jaden walked into the kitchen and set the glasses on the counter. Dr. Perkins followed him, and Jaden turned around when he knew his professor was right behind him. Dr. Perkins stepped back, bumping into the small island. Several extra glasses of strawberry shortcake clinked together from the impact. “I’m sorry,” Jaden said, though he wasn’t. He loved that he could unnerve his professor. “I don’t mind. I’d like to help you.” Jaden pitched his voice low and rough.